CANADIAN DEFENCE MATTERS: LIGHT FIGHTER PART ONE - WHAT EVER HAPPENED TO THE LIGHT FIGHTER? LIGHT FIGHTER PART ONE - WHAT EVER HAPPENED TO THE LIGHT FIGHTER? What is it about the light fighter that excites the imagination? To some a light fighter is just another type of fighter aircraft, usually with a relatively small airframe and a comparatively high power-to-weight ratio. To others, usually pilots, it is the aerial equivalent of a sports car. Even before the advent of the jet age aircraft designers and military pundits were intrigued by the concept. The ideal is an aircraft which is affordable, competitive and can stem the always rising tide of complexity. Historically they have been dismissed by military planners as being too limited in capability but, depending on which aircraft are included in this category, some have been quite successful. But what happened to the light fighter and where is the next great light fighter? The Folland Gnat was a British private venture design for a light fighter which in many ways defines the type. The Gnat was designed by W.E.W. Petter, who famously quit his job at English Electric working on the Lightning. Believing it to be too expensive and complex, he designed the private venture Folland Midge, which he developed into the Gnat, which first flew in 1955. In the event it was not adopted by the UK, the pilots may have loved it but the Royal Air Force could not get over the fact that it had to be delivered to the Far East by air freighter. That setback did not prevent it from having some sales successes. Although never used as a fighter by the RAF, the Gnat T.1 trainer variant was widely used. It became well known as the aircraft of the RAF's Red Arrows aerobatic team. This relationship between light fighters and advanced trainers is another common feature of the genre. Part of the appeal of the Gnat was that it was designed to allow construction without specialized tools by countries that were not highly industrialized. In the end the Gnat was exported to Finland, Yugoslavia and India. The Indian Air Force became the largest operator and eventually manufactured the aircraft under license. India was pleased enough with the aircraft to develop their own modified and improved variant, the HAL Ajeet. Another attempt to find an affordable fighter was the NATO Light Weight Strike Fighter competition of the early 1950s, which led to a variety of designs. In 1953, NATO Supreme Command issued specifications for a new light tactical support aircraft. European manufacturers were invited to submit their designs. It was intended to produce an aircraft that was light, small, expendable, equipped with basic weapons and avionics and capable of operating with minimal ground support. It was believed that, in the face of the nuclear threat to large air bases, many cheaper aircraft could be better dispersed. Once again, however, it was also an attempt counter the trend towards larger and more expensive aircraft. The competition led to designs such as the French Dassault Étendard VI, the US Northrop N-156 (which became the F-5) and the Italian Fiat/Aeritalia G.91 which was the winner. The competition also compared engines and selected the Bristol Siddeley Orpheus - which had been developed for the Gnat - as the winner. In the end the G.91 was in production for 19 years. 756 aircraft were completed, including all models. An additional 67 aircraft, a twin-engined variant, the Fiat/Aeritalia G.91Y, nicknamed "Yankee", which replaced the original Bristol Siddeley Orpheus engine with two General Electric J85 units were also produced for the Italian Air Force. The Fiat G.91, which looked like a diminutive F-86K, (possibly because the F-86K was being manufactured in Italy at the time), enjoyed a long service life that extended over 35 years. Aeritalia built 174 G.91s for Italy, which included 101 two-seat trainers for AMI, plus 144 variants for West Germany. The German order involved a production run of 294 G.91s built in Germany. The German Air Force purchase also included 44 G-91T two-seat trainers and another 22 trainers which were produced in Germany, ending production in 1972. It entered in operational service with the Italian Air Force in 1961, with the West German Luftwaffe, in 1962, and later served with the Portuguese Air Force where it saw combat in Africa. The Étendard VI, originally powered by the same Bristol Siddeley Orpheus turbojet, lost out to the G.91 in the NATO contest. It was successfully developed into the SNECMA Atar 8B turbojet powered Étendard IV, a subsonic carrier-borne strike fighter, for French Navy service. 90 of them were produced and it was in service from 1962 to 1991. It was followed by 85 uprated versions dubbed Super Étendard some of which are still in service. In Canada the original Étendard IV was on the short list of possible Banshee replacements when the RCN was still contemplating jet fighters and figured in a competition which saw the Northrop F-5 come into Canadian service. In the mid-1950s, Northrop had started development of a low-cost, low-maintenance fighter, with the company designation N-156, to meet a U.S. Navy requirement. When that requirement disappeared Northrop continued development of the N-156, with both a two-seat advanced trainer, which became the T-38t, and a single-seat fighter, which became the F-5. The design effort was led by Northrop vice president of engineering and accomplished aircraft designer Edgar Schmued, who had been the chief designer of the successful P-51 Mustang and F-86 Sabre fighters. Chief engineer Welko Gasich convinced Schmued to use J85 jet engines, which had been developed to power McDonnell's ADM-20 Quail decoy used by the Boeing B-52. He also introduced the concept of "life cycle cost" into fighter design, which provided the foundation for the F-5's low operating cost and long service life. In the end the Northrop F-5A/B Freedom Fighter, and the follow on F-5E/F Tiger II, became a widely used and popular light supersonic fighter aircraft. Although less complex and with avionics less advanced than some contemporary aircraft such as the McDonnell Douglas F-4 Phantom II, it was significantly cheaper to procure and operate, leading to widespread popularity as an export fighter to U.S. allies. It was not procured in volume by the United States, but by some measures it was perhaps the most effective air-to-air fighter possessed by the U.S. in the 1960s and early 1970s. It strengths included the ability to achieve surprise due to small size rendering it difficult for opposing pilots to see, excellent maneuverability, nearly viceless flying qualities and a resulting low accident rate, and a high sortie generation rate. The general high capability, reliability, and maintainability of the F-5 are such that hundreds have remained in service with multiple air forces into the 21st century. 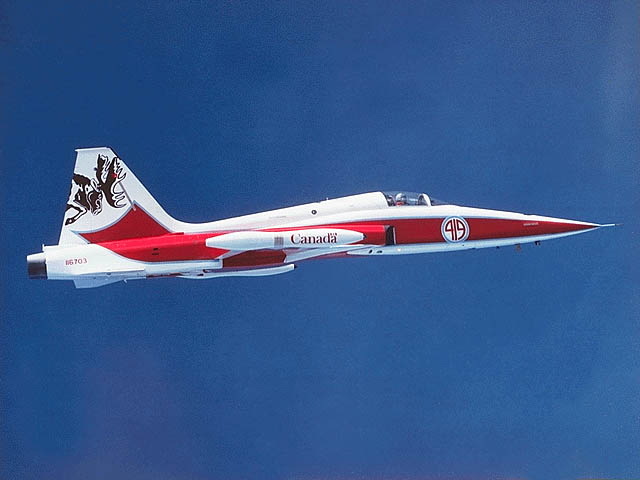 The Canadair CF-5 (officially designated the CF-116 Freedom Fighter) was the Canadair licensed-built version of the F-5 built primarily for the Canadian Armed Forces. When Canada gave up its nuclear capability in the 1960’s and cut down its European presence to only three Starfighter squadrons the lack of useable fighters became apparent. The RCAF had never been unable to procure enough CF-104 Starfighters and CF-101 Voodoos in to replace all the Avro CF-100s and Canadair Sabres previously in service, and the RCAF had a need for a more affordable supersonic fighter. In search of a more affordable fighter, Canada launched a competition for a lightweight fighter contract. The list of competitors included aircraft that were far from lightweight. They included the Fiat G-91, Douglas A-4 Skyhawk, McDonnell F-4 Phantom, Rockwell A-5A Vigilante, Grumman A-6A Intruder, LTV A-7A Corsair II, Republic F-105 Thunderchief, North American F-100S, the North American F-107A, the General Dynamics F-111, and the Northrop F-5 Freedom Fighter. The RCAF had a strong preference for the F-4 Phantom, but in July of 1965, the Canadian government announced that the Northrop F-5 Freedom Fighter had been chosen as the winner. The reason for the selection was primarily on the grounds of cost, the F-5 being considered cheaper than any of the alternatives. However, as part of the agreement, the Canadian government had insisted on a license production arrangement. In July of 1965, Canadair Ltd. was named as the primary contractor. The Canadian-built F-5 was referred to as CF-5A to distinguish it from Northrop-built machines. The Canadair version had several modifications. In order to reduced takeoff distance by almost 20% it featured a two-position nose landing gear; compressed it operated like the original, but extended (before takeoff) it raised the nose and thereby increased the angle of attack and increased lift. A mid-air refueling probe was installed as well as Orenda built General Electric J85-15 engines with 4,300 lbf (19 kN) and a more sophisticated navigation system was added. The nose of the CF-5 was also interchangeable with a specially designed reconnaissance set with four cameras in it. The CF-5 was upgraded periodically throughout its service career in Canada. In 1988, a major upgrade program was initiated, under which 23 CF-5As and 33 CF-5Ds were provided with new wings, fins, control surfaces, and undercarriages to extend their service lives. Additionally the windshield, fuel tanks, flexible hydraulic hoses, and the brake chute springs and cables were replaced and the aircraft was completely rewired and repainted. The aircraft were given provision for a MIL STD 1553B digital databus, and a radar altimeter was installed. In November 1990, a second phase was authorized in which 11 CF-5As and 33 of the CF-5Ds were to receive an avionics upgrade. The goal was to transform the CF-5 into an airborne CF-188 Hornet simulator, and the program was known as Avionics Upgrade Program. Although the CAF retired the type in 1995 it continued to be used by other countries into the early 21st century. Total production by Canadair for the CAF was 89 single-seat aircraft and 46 dual-seat aircraft. Many were also built for the Netherlands and Norway as well, and some surplus aircraft were sold to Venezuela. Purchased for industrial and political reasons in lieu of more expensive and complex aircraft, it was always something of an afterthought in the CAF. Perhaps because it was selected originally to fill a tactical support role with 10 Tactical Air Group based in Canada it carried the stigma of being “the army’s fighter”. However, the role for the CF-5 during its service with the RCAF changed frequently; it was committed to NATO's northern flank to act a rapid-deployment force, and served as a light attack strike fighter, reconnaissance platform and trainer. With little thought given to its low operating costs, said to be less then a third that of the CF-18, when the time came to cut the budget it was the CF-5 that was sacrificed. In time the loss of advanced trainers and low-cost adversary and close air-support training was, partially, replaced by contractors. What has not been regained is the idea of the light fighter and its place in Canadian defence. LIGHT FIGHTER PART TWO - HOW MUCH DOES A LIGHT FIGHTER WEIGH?